Bachelor of Science in Nursing graduate. Computer literate, Word, Excel, Photoshop, etc. 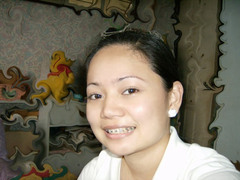 Hobbies & Interests: i love to read fictional and educational books, articles etc. i surf the net a lot, i listen to all kinds of music. im a confessed mallrat/shopaholic. i love to take and collect photos of me, my family and friends for memories sake. i love the beach, it is my only getaway from civilization, it makes me sane.i love dogs, i have 2 shih tzu and i also plan to get a dog or 2 from the shelter. i listen to other people's point of view and opinions. iam a fast learner, i love learning new things, its an adventure for me.